As you know email is one of the best ways to connect with and engage customers. But unless you follow best practices, email marketing can also be frustratingly difficult. Here are 5 brief tips that you should consider before hitting send on your next campaign. The “info” Email The number one mistake is sending an email from info@yourbusiness.com. Be sure to send it from a live person or even a fictional employee. The point is to use someone’s name and make it personal. Subject Line Make it as clear as possible and worth clicking on. Avoid typical subject lines such as “How To” and write the offer codeine pills online. 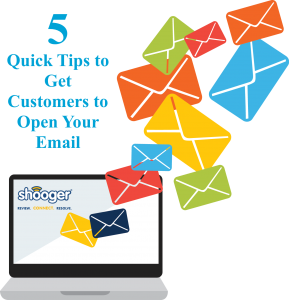 Make the email as relevant to the customer as possible. Studies show a direct link between relevance to the reader and likelihood of the email being opened. Automate It Schedule your personalized emails for various times of the year in one sitting. You can plan a week, month or year of promotions in advance and then let marketing automation software do the rest. This can be done very easily with Shooger. And as you attract new subscribers they can be automatically added to your email database. Send Your Emails During A Relevant Time Of Day Or Occasion For example, if you sell luxury chocolates be sure to send out emails from mid-January to Valentine’s day so customers remember to make the purchase for their special someone. If you don’t send an email with a reminder offering a particular brand or even a discount, you’re not taking full advantage of a time when email open rates will likely be higher. Keep It Simple Remove the clutter. Explain what you want the recipient to do or what you are offering. This way they are more likely to click through to your website. By following these easy steps, you will increase your customer base and keep returning customers coming back.